Honolulu condo and loft news. Monday, April 11th, 2016 at 2:07pm. Thursday, April 7th, 2016 at 12:16am. An efficient and spacious 1 bedroom, 1 bathroom floor plan with large lanai located on the corner-end with views of the brilliant colors of city lights. Great for vacation home and/or rental opportunity, or simply call it your primary home. Improvements throughout the condo unit, a move-in condition. Island Colony is a reputable high-rise condo hotel, secured building with open air lobby, resort like amenities such as pool, fitness center, outdoor seating deck, a convenient store and cafe onsite, located in the most convenient short distances to the essentials of the world's famous resort Waikiki destination. Monday, March 7th, 2016 at 10:43am. This 2 bedroom, 2 bathroom condo is tastefully furnished & in ready to move in condition. For investors, rental income is $6,000 -$7,000 monthly. Beautiful, Japanese style bath with upgraded TOTO hand showers and gourmet kitchen with Viking appliances in a luxury condo at the gateway to Waikiki! Wonderful amenities offered in this pet-friendly building including pool, BBQ, fitness center, meeting room, coffee bar and more! Washer and dryer and Owner's Locker in the unit. Monday, January 18th, 2016 at 11:22am. This fully furnished, corner, high floor unit has fantastic mountain views, marble floors, and an enclosed lanai. No sandwich lease. 100% Fee Simple. Great amenities includes pool, jacuzzi, BBQ area, tennis courts, basketball court, & a play ground. 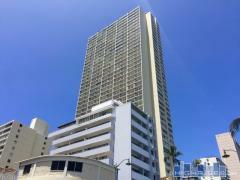 Just a few steps from the Waikiki beach, Kapiolani park, Zoo, Waikiki shopping and restaurants. Thursday, January 7th, 2016 at 1:19pm. Incredible views from this high floor, beautifully upgraded home in the sky. Watch the waves roll into Ala Moana Beach Park, the paddlers on Ala Wai canal, enjoy the city lights or lift your eyes to the majestic mountains of Oahu all from your own lanai. This tastefully upgraded unit shows pride of ownership and is great for entertaining or can be a soothing private retreat. A fabulous location with everything needed within walking distance, as well as the beaches and all Waikiki has to offer, you could not ask for more. But wait, 2 parking stalls in Waikiki??? Priceless!